This Monday, the crypto sentiment among the top 10 coins by market capitalization is at 5.79 - the highest score since at least February, and certainly above last Monday’s 5.66, according to Predicoin, a crypto market sentiment analysis service. 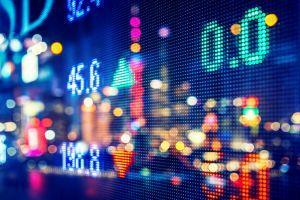 Bitcoin reached it's new heights this year and marked at least its seventh consecutive top spot on the list. Out of the top 10 coins, four are in the somewhat positive zone (score above 6), while all the rest are in the neutral zone. Notably, however, only one coin scored below 5, and that’s Stellar at 4.7, down from last week’s 5.4 and back to the range it was stuck in during the time before that. No coins are in the negative range, and even XRP - notorious for only getting up to 4.7 on February 24th - has broken through the middle score and now sits at 5.1. The absolute winners for the beginning of this week, aside from Bitcoin (having scored 7.1), are Bitcoin Cash at 6.1, Litecoin at 6.4, and EOS at 6.3. 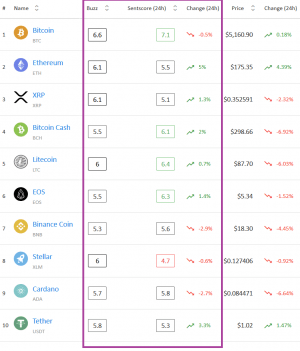 Although losers are somewhat hard to talk about, given that no coins are below 4 and only Stellar is below 5, other lower-rated cryptocurrencies include the aforementioned XRP, followed by Tether at 5.3 and Ethereum at 5.5. All of these scores indicate growing positivity surrounding the cryptocurrency market as a whole, no doubt at least partially driven by last week’s market rally that does not seem to be letting up. Compared to last week, four coins have dropped, however: Ethereum went from 5.8 to 5.5, Binance Coin dropped from 6 to 5.6, Stellar went from 5.4 to 4.7, and Cardano slipped from 6.4 to 5.8. This means that two coins - Binance Coin and Cardano - left the positive zone for the neutral zone, while the other two are still stuck in the neutral range. All other coins improved their respective scores this time around. As for weekly improvements, EOS wins this round with an increase of 17.9%, followed by XRP, which jumped by 10.3% in score. EOS boasts a high technical score at 7.6, while its biggest weakness is social at 4.6. XRP, meanwhile, can thank news (8.1) for its improvement, while its technicals are sorely lacking, having scored only 2.6. The losing list is headed by Ethereum, which lost 9.9% of its score, with its weakness lying in technicals at 3.2, and news (6.9) still holding it above water. Following Ethereum is Stellar, having lost 7.3% with the same technical score as its biggest weakness. News are also its strongest aspect, and Stellar scored more than Ethereum in this case: 7.5 in total. Predicoin measures the market sentiment by calculating the SentScore, which aggregates the sentiment from news, social media, technical analysis, viral trends, and coin fundamentals based upon their proprietary algorithms. 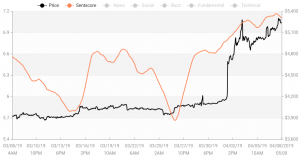 As their website explains, “Predicoin aggregates trending news articles and viral social media posts into an all-in-one data platform, where you can also analyze content sentiment,” later adding, “Predicoin combines the 2 sentiment indicators from news and social media with 3 additional verticals for technical analysis, coin fundamentals, and buzz, resulting in the SentScore which reports a general outlook for each coin.” For now, they are rating 30 cryptocurrencies.